With every passing year the capability of mobile technology creeps toward its oldest and most powerful sibling, the desktop computer. Also, with every passing year, our mobile devices become more entrenched in our everyday experience, to the point where going without a smartphone for an entire day, or even a few hours, can cause significant distress amongst everyone from casual to power users. Given the importance of smartphones, one would think our most coveted devices would be able to stand the test of time, yet as any modern smartphone user knows, mediocre battery life has us often feeling like a junkie desperately trying to (power)source their next fix. Alas, we have yet to discover the magic bullet that will ultimately put our battery woes to rest. In the meantime all we can do is feverishly optimize our paltry battery life to the best of our ability. In the past we’ve shared various tips with our readers on how to get the most out of their batteries. This includes taking measures such as turning off unused connectivity options, utilizing power saving modes, and more. When it comes to optimizing your display to use less energy, one common adage is that using a black background can help you use less power. What’s the truth behind this, if any? And does it apply to all display types? Short answer: yes this is sound advice, but no, it doesn’t apply to everyone. The reason why using black backgrounds isn’t a universally good idea is that there are two primary types of display technology found in most smartphones out there: Liquid Crystal Display (LCD), and Active Matrix Organic Light Emitting Diode (AMOLED), and these two standards handle color very differently. The more black you display when utilizing an AMOLED panel, the more power savings you get. While AMOLED is the latest and greatest display technology (aside from plastic OLED) LCD is the most common and well established modern display technology due to cost and age. 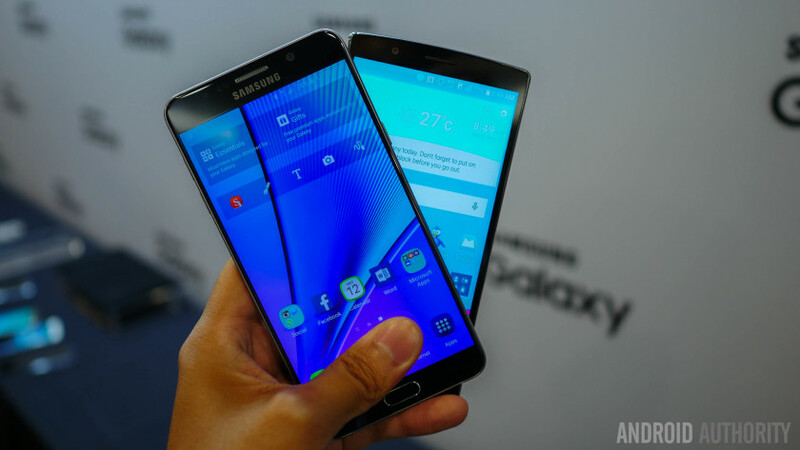 The more black you display when utilizing an AMOLED panel, the more power savings you get. In general, displays work by emitting varying degrees of light through a pixel. Each pixel is made up of sub pixels that filter light through one of the three primary colours: red, green and blue (some manufacturers have more than three sub pixels). The amount of light that passes through these shaders determines the colour of light emitted from each pixel. Unlike LCD panels, which require a backlight, or light emitting diode (LED), in order to pass light through each pixel, the pixels that make up AMOLED panels are their own source of light. Essentially, when a pixel is displaying black on an AMOLED panel it is entirely off. To emit colour, or white, it must turn on and thus consumer power. This is why AMOLED panels are perfect for features like ambient display, as most of the pixels are not consuming power, unlike LCDs, where the entire LED backlight must turn on no matter how many pixels are actually being utilized. Ok, to optimize the battery use of an AMOLED panel use black backgrounds and themes wherever possible. Got it. How about LCDs? The answer to this question is also simple, though the rationale is far more complicated. Surprisingly, white (or really any bright color) is actually the most power efficient — though marginally so. LED-LCDs are made up of five layers: a polarizer, liquid crystal, transistors, another polarizer, and a backlight. LCDs use polarization filters and electrical current to block varying degrees of light passed through the liquid crystal layer by the LED. Light is a wave that oscilates in every direction from the LED backlight. A polarization filter only allows light that oscillates on a particular plane to pass through. A horizontal polarizer allows light that oscilates on a zero degree plane to pass through, a vertical polarizer does the same except on a 90 degree plane. Essentially two perpendicular polarization filters will block all light; if you look through two perpendicular polarized sunglasses all you would see is black. One of the advantages to an AMOLED display is that you can optimize the colors better to save battery life. The two polarization filters found within an LCD are perpendicular, thus they block all light emitted by the LED. To allow light to pass through the second polarizer a layer of liquid crystal is sandwhiched in between the two filters. The type of liquid crystal used in LCDs is a twisted nematic liquid crystal that has a natural helix structure similar to DNA. As light passes through this crystal it is rotated in ways that allow it to pass through the second polarizer. In order to fine tune the amount of light that passes through shader sub pixels current is applied to the nematic liquid crystal by a thin layer of transistors. As current is applied to the crystal its helix shape untwists, which prevents it from rotating light waves and allowing them to pass through the second polarizer. The more current you apply to a nematic liquid crystal the more it untwists, thus the more light that is blocked. Long story short, in order to create black, an absence of light, you have to completely untwist the liquid crystal by applying the greatest amount of current, which utilizes the greatest amount of power. Therefore, a brighter color, such as white, is actually more efficient in this case. In practice, the difference in battery consumption for LCD displays is fairly negligible though. Well, it wasn’t easy, but we have the answer(s). 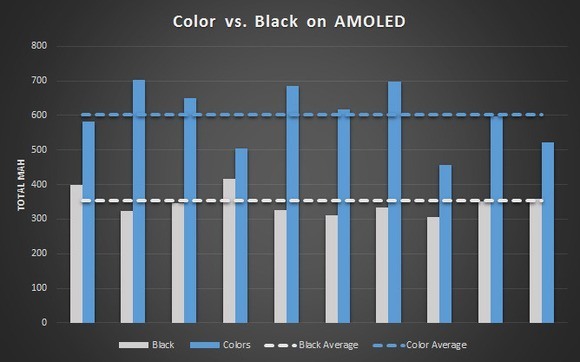 The important takeaways from this analysis are: black uses noticeably less power on AMOLED displays, AMOLED displays use less power than LCDs, and bright colors are the most efficient for an LCD panel. Hopefully this knowledge will help you extract every last bit of life out of your precious phone.